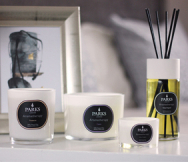 Parks’ pure floral scents have always been customer favourites. Some seek out the pure notes of individual flowers because of a love for that one scent, in particular. There are also customers who want to achieve a perfect balance of scents of their own devising, while others are following the advice of aromatherapists. No matter what brings you to this pure, organic and 100% naturally derived rose perfume, it will quickly become an indispensable part of both your home and your life. Rose is one of those incomparable scents which make an impression that lasts. Who can ever forget the scent of the first rose they gave or received? Who can pass by these lovely blossoms in the fullness of summer without sampling their natural perfume, or resist the chance to fill their home with the scent of them, when doing so is so easy and trouble-free? We use only the finest traditional methods to gather all of the natural rose oil, which is also called attar of roses. The oil is steam distilled from rose petals, just as it has always been done, with over 2000 roses needed to produce just one gram of oil! However, we would never dream of allowing a single shortcut, or of presenting you with anything less than the true scent of rose in any Parks product. The lovely decorative 100 ml bottle and all-natural diffuser wands come in a presentation quality gift box that can be either given as provided or wrapped up to preserve the mystery of the gift, depending on the occasion. Although, the truth is, many of our customers are really treating themselves!